Here is the list of the hotels near Choilley-Dardenay. Book your hotel near Choilley-Dardenay today, Friday 10 May for the best price, reservation and cancellation free of charge thanks to our partner Booking.com, leader in on-line hotels reservation. Below here is the list the 50 closest hotels of Choilley-Dardenay, sortable according your criteria. You will find the position of these accommodations on the Choilley-Dardenay hotels map. Located in Champagne-sur-Vingeanne, this former train station now works as a guest house, which offers a heated, outdoor swimming pool, a terrace and a large garden. Dijon is just a 30-minute drive away. Decorated in a modern style, all rooms feature wooden flooring, heating and a private bathroom with a walk-in shower. Some rooms also have a fireplace. A continental breakfast serving hot drinks, orange juice, bread, croissants and marmalade is provided each morning. Guests can also enjoy regional cuisine, prepared by the hosts upon request. Additional features include a possibility to borrow bicycles and boules, free Wi-Fi access and free private parking on site. The A31 motorway is ideally located 26 km from the property and the Wine Route is a 40-minute drive away. Bed and Breakfast Spoy Preferred hotel ! 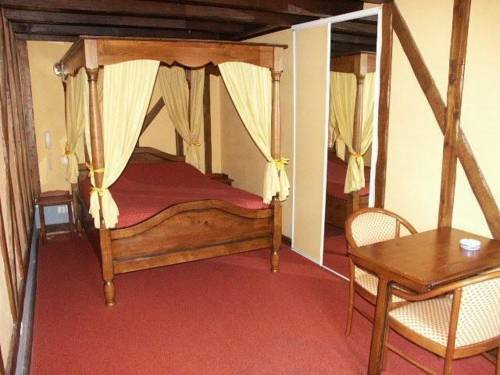 Featuring free WiFi, a restaurant and a sun terrace, La Charmerie offers accommodation in Spoy. Guests can enjoy the on-site bar. Free private parking is available on site. The rooms feature a coffee machine and a private bathroom. Breakfast can be enjoyed every morning and is free for children aged 7 years old or younger. Guests can also have dinner at the property upon request. Bike hire is available at this bed and breakfast and the area is popular for cycling. Dijon is 18 km from La Charmerie, while Langres is 48 km from the property. The nearest airport is Dole - Jura Airport, 49 km from the property. Bed and Breakfast Beire-le-Châtel Preferred hotel ! Featuring free WiFi and a seasonal outdoor pool, La Houblonniere offers accommodation in Beire-le-Châtel, 19 km from Dijon. It is set in a 18th-century house. The double room is fitted with a private bathroom equipped with a shower and it offers pool and garden views. The bedding has been recently renovated. Guests can enjoy the on-site restaurant upon prior reservation. Free private parking is available on site. A31 Highway can be reached within 11 km. Dole - Jura Airport is 57 km from the property. Below here is the hotels map of Choilley-Dardenay. Names and details of Choilley-Dardenay hotels can be shown on the map clicking on the prices icons.